This is the second time in a month that I am contacted by a person wanting to buy a horse and wants me to give my opinion on the horse. This time, the veterinary visit was made and the horse did not pass the flexion test at the anterior right. But not being sure, the veterinarian tried a second time, blurring any information. Working on the horse, I discover that the horse can not make a smooth transition, walk/ trot and trot/walk and can't gallop comfortably on the left hand, on the right hand no problem. All the left side of the horse was upset from the head to the back leg. It's the same as doing a flexion test on yourself even though you're stiff as a stick, you will fail the test too. This is the second time in a month that I am contacted by a person wanting to buy a horse and wants me to give my opinion on the horse. 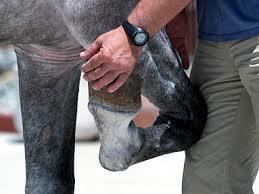 This time, the veterinary visit was made and the horse did not pass the flexion test at the anterior right. But not being sure, the veterinarian tried a second time, blurring any information. Working on the horse, I discover that the horse can not make a smooth transition, walk/ trot and trot/walk and can’t gallop comfortably on the left hand, on the right hand no problem. All the left side of the horse was upset from the head to the back leg. It’s the same as doing a flexion test on yourself even though you’re stiff as a stick, you will fail the test too. « Why do you have a Dry Skin?